based on 1 Peter 1:5-6. God has been blessing our ministry and continues to perform miracles in the lives of our people. We believe in restoration and in a God who sent His son to die for ALL people, not just those that claim His holy name. In fact, we believe the Biblical principle of John 3:17 so much that universal redemption is interwoven in our every teaching. Come join us as you escape into God’s wondrous love and enrapture yourself in Jesus Christ today because TODAY is the day of salvation. Stop worrying about heaven or hell – that was taken care of at the cross almost 2,000 years ago. Jesus knocks at the door of your heart today (Rev. 3:20). Hope to see you soon, in person, or even on Facebook Live. (Street Parking on Pacheco Blvd. and Ladybug Ln). We’ll have a phenomenal time of praise and worship, fellowship, and reflection! Welcome to Dapstep Ministries! We are a home church dedicated to spreading the good news of Jesus Christ! We hope you can come visit us at 121 Ladybug Ln. in Martinez, CA on the 1st and 3rd Sunday of each month for our 11:00 AM worship service. We always have food and fellowship afterward and celebrate the Lord’s table (Communion) on the third Sunday of the month. If you can’t visit in person, join us on Facebook Live and check out our video recordings of our worship services! And, every Wednesday evening, at 8:00 PM PST, we hold a weekly prayer call. All are encouraged to join us, even if all you’d like to do is listen! Our call in number is: (641) 552-9361. 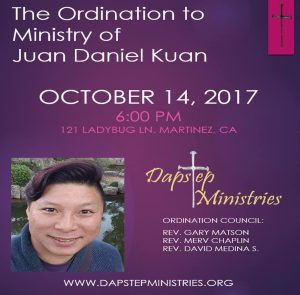 Dapstep Ministries is happy to announce the ordination of Juan Daniel Kuan, our Pastor, Spanish Language Ministry. 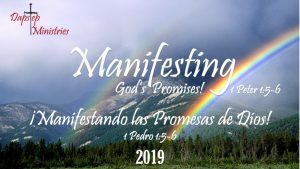 Please come expecting God to do so something wonderful in your life. 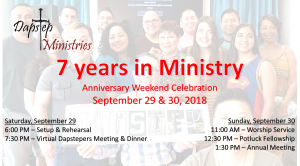 Welcome to Dapstep Ministries! Every Wednesday evening, at 8:00 PM PST, we hold a weekly prayer call. All are encouraged to join us, even if all you’d like to do is listen! Monthly, we have a Friday night of intimate worship – 7:30 pm in Martinez, CA. The next Friday night worship services is Friday, November 10, 2017 at 7:30 pm! And, finally, join us on Facebook Live on the first and third Sundays of each month at 11:00 AM. Welcome! Welcome! Welcome! God loves you just as you are! And, so do we!